Prototype: 4 German Federal Railroad DB type Sm 24 interchange design flat cars, as open freight cars, for the transport of vehicles. 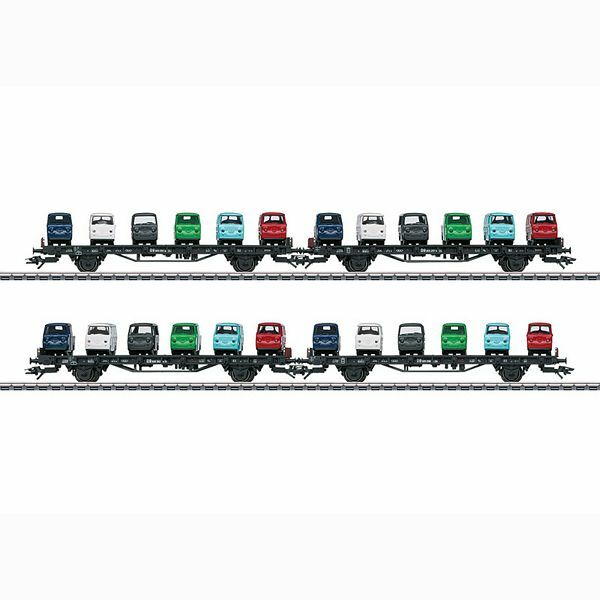 Each flat car is loaded with 6 Goggomobil transporters in different colors. 2 each Goggo pickups, 2 each Goggo panel vehicles, 1 each Goggo transporter with an open door, 1 Goggo station platform cart. The flat cars and the vehicles look as they did around 1959. Model: The flat cars have a long wheelbase. The flat car superstructures have load restraints for vehicles. All of the flat cars have different car numbers. Each flat car comes loaded with 6 Goggomobil models from the firm Brekina, in different colors. The cars are individually packaged. Total length over the buffers 63 cm / 24-13/16". DC wheel set per car 2 x 700580.